Halloween is just around the calendrical corner, that night when the border between worlds is at its thinnest and denizens from the other side cross over. Sadly, that’s the best segue I could come up with by way of introducing today’s EATING AUTHOR guest, Douglas Smith, who has crossed Canada’s less-than-spooky-border to be here. 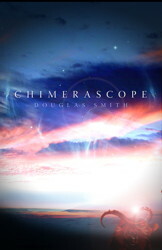 Doug writes both non-fiction and fiction, novels and short stories. 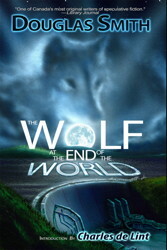 He’s a three-time winner of Canada’s Prix Aurora Award and been nominated for it nineteen times! 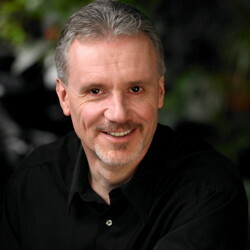 He’s also been a finalist for the Sunburst Award for Excellence in Canadian Literature of the Fantastic, as well as several other nifty prizes, including the John W. Campbell Award. 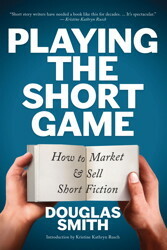 In the non-fiction realm, he recently released Playing the Short Game, which may just be the definitive handbook for selling short genre fiction. And in a related bit of ‘paying it forward’, Doug is the keeper of the fabled, Foreign Market List, the best place I know to check out where to send a short story when you’re looking to see your work in another language. And if you have any doubts about trusting the list, let’s just note that Doug’s own work has appeared in twenty-five languages and thirty countries. 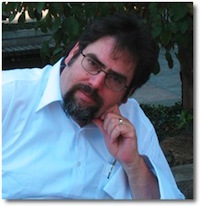 LMS: Willkommen, bienvenue, and welcome, Doug. It’s been a while now since I asked you to about your most memorable meal. What have you come up with? DS: Thanks, Lawrence, for inviting me to contribute to this fascinating series. When you asked me, I must admit that a particular dining experience did not immediately jump to mind. But I’m lucky enough to have a day job that brings regular global travel (twenty-five countries and counting). When I travel, I always try the local cuisine as much as possible. Plus my business associates, eager to impress foreign guests, tend to select the better restaurants. So I assumed I’d have no trouble picking a memorable meal from my travels. Maybe that restaurant in the Fisherman’s Bastion in Budapest, with that fantastic view high above the Danube? Or that wonderful cramped Italian restaurant in Amsterdam, where the earlier visit to a nearby “coffee shop” just might have enhanced the meal? Maybe that amazing tapas restaurant in a refurbished wine cellar in Barcelona? Or that little trattorie discovered in a hidden piazza in Rome while strolling between ruins and monuments? How about one of the several (large) steak dinners with too many bottles of Malbec in Buenos Aires? Espressos and pastries at Les Deux Magots in Paris, that favorite haunt of Hemingway and Sartre (complete with snooty waiter–hey, at least I tried to order in French)? Okay, I’m name dropping. Well, place-name dropping. But they were all memorable meals and venues. So which one? Oddly, I kept coming back to two meals, neither of which involved restaurants–or even eating inside. I’m a cyclist, and when I travel, my favorite way of getting to see a city is by bike. Outside of North America, I’ve cycled in Dublin, Amsterdam, Copenhagen, Helsinki, Paris, Barcelona, Gerona, Madrid, Sydney, Budapest, along the Danube through Slovakia and Hungary, and all over the southern island of New Zealand. And I kept coming back to two “cycling” meals. One was on cycling tour out of Paris to Claude Monet’s restored home and gardens in Giverny. Art is another interest of mine (appreciating it, not doing it—I can barely draw a happy face). Being able to visit where the French impressionist painted many of his most famous scenes was a real treat, especially doing so by bike. Along the way, our group stopped in a small village and visited their market in the main square, where we each shopped for our lunch. Back on the bikes again, our purchases in the panniers, we cycled out of the village to a beautiful serene spot on the Seine (see picture). 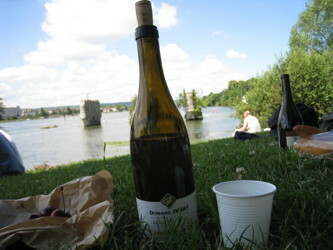 There, under the shade of trees, we settled on the soft grass beside the river for our outdoor repast. Mine was a jambon et fromage baguette—a ham and cheese sandwich, but it sounds better in French. And it tasted better, too. The bread was so fresh—soft inside, just the right amount of crusty outside. The ham was sweet and juicy, and the cheese (can’t remember which I chose) was tangy. Plus a bottle of a French Bordeaux, fresh cherries, and a melt-in-your-mouth croissant. The day was warm and sunny, the sky bright blue and lightly clouded, the scene as idyllic as something Monet might have painted. All in all, that lunch was the perfect prequel to cycling the quiet roads into Giverny and touring those amazing gardens. My other memorable cycling meal came during a six-day tour on the south island of New Zealand. This was the first time I’d done an extended tour by bike, and I fell in love with New Zealand’s scenic and ever changing beauty. The tour was supported with a sweep van that followed us (in case you wanted to ride instead of cycle up one of the many mountain passes). The same van provided our mid-morning snack and lunch. There were seven of us on the tour, and we all became fast friends. We had two guides, Kip and Geoff, who took turns driving the van or cycling along with us. At night, we’d stop at an inn or motel. Nothing fancy—we didn’t need fancy. After riding between seventy and a hundred kilometers, all you wanted was a shower, a decent meal with lots to eat, and a place to sleep. And sleeping was never a problem after a day on the bike. But it wasn’t an evening meal that I remember most. Rather, it was one of our mid-morning stops. Kip and Geoff would always pick the most scenic spots for these “snacks.” By the time we reached the location by bike, they would have a buffet laid out on folding tables beside the van. 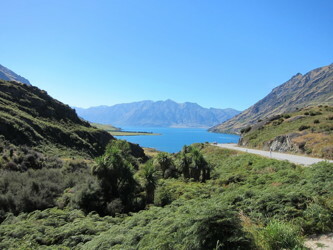 My favorite came on Day 2, where we were cycling up the pass between Lake Wanaka and Lake Hawea. The food was nothing fancy, but it was healthy, fresh, and delicious. Bananas, oranges, melons, apples, plums, and more fruit and juice choices. An assortment of baking, all done by Kip for the trip. And of course, coffee and energy bars, a requisite for cyclists. If this doesn’t sound like it would match up to, say, a fine meal in Paris, remember that cycling up mountain passes tends to stimulate the appetite (you think?). Even though these snack stops were only a couple of hours after breakfast, we would always arrive famished. But it was the view that particular morning that made this a memorable meal (see picture). We all sat around in our lycra on folding chairs, wolfing down the fresh food, and enjoying the warm sunshine, the friendship, and most of all the spectacular view. In New Zealand, the beauty just keeps on coming—mountains, lakes, river gorges, rain forests, rugged coastlines. I could have picked any of our many stops, but this was perhaps my favorite. So no restaurant in my picks but I’d gladly repeat either of those meals anytime. Thanks, Doug. When I was in New Zealand I was writing a piece on (what at the time) was considered the best restaurant in Wellington. The national museum, Te Papa, had a five star chef who prepared a special meal just for me. But now I’m wondering if I should have cycled up a mountain instead… Nyah. This entry was posted on Monday, October 27th, 2014 at 7:30 am	and is filed under Plugs. You can follow any comments to this entry through the RSS 2.0 feed. You can leave a response, or trackback from your own site.